The Maine Moose – including Bonny Eagle's Tanner McClure (back row, third from the left) – pose with their championship banner, their individual medals and their No. 1 signs. 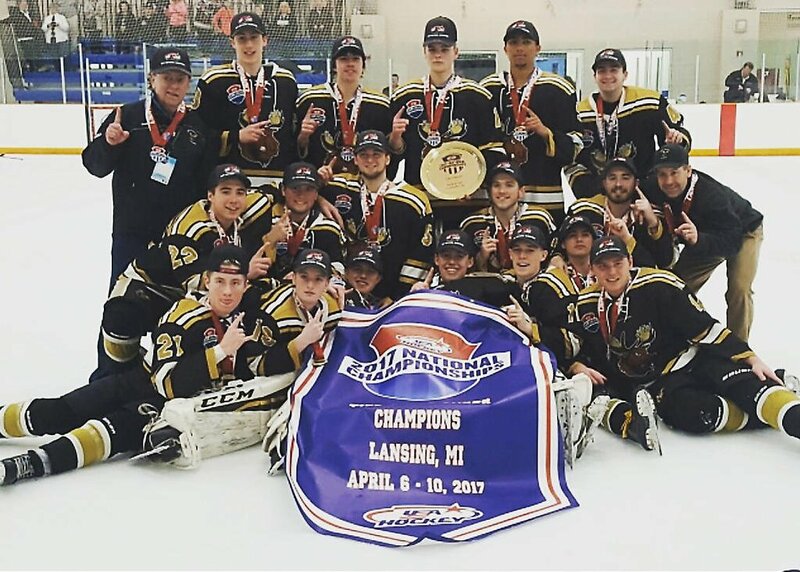 EAST LANSING, Michigan, and BUXTON — The Maine Moose have won it all: They’re national champions, and Bonny Eagle’s own Tanner McClure gets the credit for the goal that won it all – the last goal of the last game. McClure struck midway through the third period of the tournament final, securing a 3-2 triumph over the New Hampshire Avalanche in a back-and-forth battle. It’s McClure’s second consecutive national title as a Moose; he won last year as a member of the U16 club. This time around, he’s on the U18 outfit. Specifically, the Moose compete in the 2A Division of USA Hockey’s Youth Tier II. The first period of April 10th’s grand finale (held in East Lansing, Michigan) passed scorelessly; not until the second did either team finally figure out the opposition defense. When that happened, it was the Moose who struck first, Gavin Bates scoring a powerplay point vs. Avalanche netminder Padraig Capsalis on assists by McClure and Cody Doyon. Just over eight minutes later, the Avalanche responded, Armando Roberto IV besting Moose keeper Derek Fournier on a feed from Tyler Chipman. 1-1. Down a man to begin the third – Andrew Rodrigue pulled two minutes for holding just 42 seconds in – the Moose nevertheless managed to strike again: Jeremy Rancourt, breaking up the right side of the ice, beat Capsalis with a top-corner, glove-side wrister. But soon enough, the Avalanche caught up again, Chipman tallying on a John McDonough assist for 2-2 at the 7:39 mark. Would the see-saw battle run into OT? To reach the final, the Moose had to get past a variety of opponents from around the country. They began the tournament on April 6 with a 5-1 over the Chesterfield Falcons, out of Missouri. A day later, they battered the Junior Sun Devils, members of the Desert Youth Hockey Association in Arizona. On April 8, they topped the Alaska Wolves 8-3, and on the April 9, in the semifinals, they brushed aside the Fort Wayne AWP Elite 11-2. The Moose hail from across Maine, as McClure notes: “I’m the only kid from around here,” he says. “Most are from Lewiston or the Augusta area. Then we have a couple from the Bangor area and one from Houlton. We’re a mix from all over the state. The Maine Moose – including Bonny Eagle’s Tanner McClure (back row, third from the left) – pose with their championship banner, their individual medals and their No. 1 signs.